Grease and line an oblong (13 x 9 inch) tin with parchment paper. In a mixing bowl beat the 4 eggs with the sugar for the sponge base. It should become very light and aerated. The whisk should leave a pronounced figure of eight on the surface of the mixture when the whisk is lifted out. Gently fold in the sifted flour with a metal spoon. Be very gentle so as not to knock the generated air out of the sponge but also ensure that all of the flour is incorporated. Pour the mixture into a prepared Swiss roll tin. Bake for 20 minutes, until well risen and golden brown. Put the ice cream, brandy, cinnamon and apricots into a large mixing bowl and mix well until combined and slightly softened. Place the sponge on parchment paper, and with the side facing you, spoon the ice-cream over the base and roll into a tubular shape. Using the parchment paper wrap up the ice-cream filled sponge tight into a tubular shape (log shaped) and freeze for a minimum of 1 hour. Place the water, sugar and glucose into a medium saucepan and place onto a moderate heat. If you have a sugar thermometer put it into the pan and wait until it reaches 117°, if not check the consistency by using two spoons, when pulled apart there should be difficulty in moving them through the syrup. In a large clean mixing bowl start beating the egg whites until they are stiffly beaten, then reduce the speed of the whisk in the egg whites and gently pour the boiled sugar on top. Continue to whisk very slowly until the mixture is cool, it should be smooth and glossy. Cut the top third off the top of the log and fix it to the side of the cake (to represent a yule log shape!) 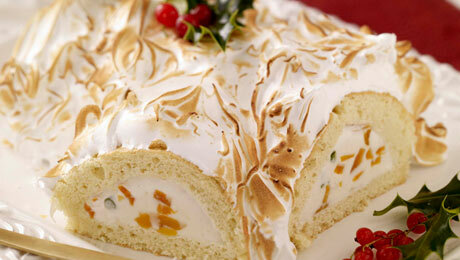 and cover with the Italian meringue. Grill the meringue slightly just before serving to give it a nice golden brown effect. Decorate with berries, or seasonal holly.